If you are ready for some intermediate-level material when working with IBM SPSS Statistics software, the following list of professional development projects is for you. The case studies in the Help menu are an absolutely wonderful resource, and many new users simply don’t find them. They’re chapter-length, step-by-step, detailed walk-throughs of the techniques, accompanied with practice data. In terms of free resources, you simply can’t get any better than this. The only limitation, perhaps, is that for the more sophisticated techniques, you encounter a lot of jargon (so you may find yourself searching for more information online). Syntax is a big topic, and for many people (okay, most! ), it’s a little dry. But syntax is very powerful, and you won’t learn it by osmosis. SPSS doesn’t force you to learn syntax — you have to force yourself. Go to any procedure under the Data, Transform, or Analyze menus. Complete the dialog box as if you were going to run the technique. Before you click OK, click the Paste button. The Syntax appears in the Syntax Editor. Now you can look up the command in the Syntax Reference Guide (located within the Help menu) to learn more about it. Take a simple formula like body mass index (BMI), gross domestic product (GDP), or something from your field, and try doing the calculation in the Syntax window. Eventually, you’ll find that many calculations are faster this way, especially if you’re doing lots of similar calculations, which is very common in the SPSS world. Read the opening chapter of the Syntax Reference Guide (located within the Help menu). There are a couple of other chapters worth taking a peek at, but you can mostly use it as a dictionary. Don’t try to read the whole thing — it’s a door stopper. Create a simple project: open a file, add labels, add a variable or two, produce a table, produce a graph, and each time before you click OK, click the Paste button, which produces the Syntax in the Syntax Editor. Now you have a copy of the Syntax and you can run it, but more important, you can save it so you can redo all these techniques at a later point (with new data). For years and years, the Table module has been the most popular module in SPSS. And you can easily see why! The Table module is easy and powerful. Get a free trial copy of the complete SPSS Statistics with all the modules, and force yourself to spend a solid day using it. See if there is any aspect of reporting that you’re already doing that you could do faster with the Table module. In the following figure, you see a simple Frequencies showing two variables. Note that the categories for both variables are the same. 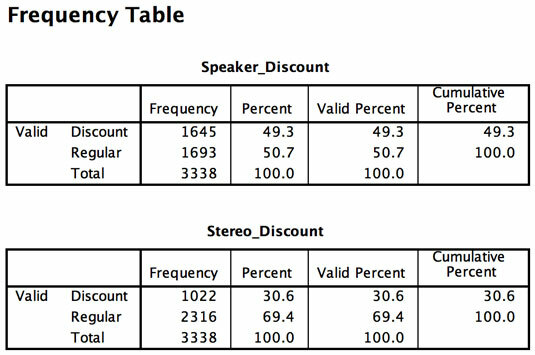 Frequencies table of the discount variables. In the next figure, you see the same data, but here the table was created using the SPSS Table module: this is a much better table. Custom table of the discount variables. You’ll likely have to present your analysis in a slide presentation someday. Most slide presentations are terrible, and you don’t want to add to the world’s inventory of bad presentations. You simply can’t be an exceptional SPSS Statistics user if no one understands what you’re trying to say about your results. R is incredibly popular. You may have even had friends compare R to SPSS and talk about how it’s powerful and free. R is powerful and free, but there is no need to make it compete with SPSS. You can use R right in the Syntax window of SPSS, giving you the best of both worlds. R has a much steeper learning curve than SPSS does. Many books on R focus on the basics, but as an SPSS user, you don’t need all that. The basics are more easily done in SPSS. The power of R in the Syntax window is that you’ll never be without a feature that you need in SPSS. If something brand new comes out, and it often appears in R first, you can access it through SPSS while still taking advantage of the very easy point-and-click interface of SPSS. Make no mistake: R is programming. Graphics Production Language (GPL) is programming, and that might be a strike against it. GPL is powerful, though. It will transform your notion of what is possible with SPSS graphics. GPL is probably the only way to be able to follow the advice of folks like Nathan Yau and Edward Tufte in SPSS. Sure, you can take their advice and do all kinds of clever things, and make some major improvements to your graphics, but if you really want to get serious about it, you’ll have to learn how to code. Output Management System (OMS) changes everything. When you grow to be a sophisticated user of SPSS, there is simply no reason to be manually cutting and pasting all your results, one at a time. That’s a frequent mistake new users make as they learn more and more SPSS. Cutting and pasting makes a lot of sense when you have one table or one graph, but you don’t want to use this approach for 30 tables or 81 graphs. The whole idea behind OMS is that you can automatically route results to just about any format in one step just by telling SPSS what you want routed and where you want it to go. Next thing you know, your Regression Q-Q Plots will all go to PowerPoint. Voilà! Years ago, there was a feature in SPSS called Macros. Some folks still like Macros. Python is the way to go, if you want to be a true power user when it comes to SPSS programming. Have no fear. If you enjoy programming, and you’re feeling brave, a free book called SPSS Programming for SPSS and SAS Users can help. As of this writing, the most recent update is for version 20, but it will give you what you need. In the SPSS Help, you’ll also find Python Integration Package for IBM SPSS Statistics and Introduction to Python Programs, both of which are great resources. Python scripting is quite different from Python programming in SPSS Statistics. Scripting has its own Help section, Python Scripting Guide for IBM SPSS Statistics. The main difference is that Python programs allow you to do more powerful things with syntax. Python scripts help you manipulate the interface — the output window, results in the output window, the graphical user interface, and so on. Scripts are very powerful, but if you aren’t a programmer, start with Python programs first.